For those of us not already acquainted with the work of Louis Faurer, the centenary of his birth is high time to get to know this “quiet” great of American photography. In the 1950s and 60s Faurer was a successful fashion photographer, working in New York for Harper’s Bazaar, Vogue, Mademoiselle, and Glamour, and as staff photographer for the visionary Fleur Cowles at Flair. He was championed by Edward Steichen, and shared studio space with Robert Frank. 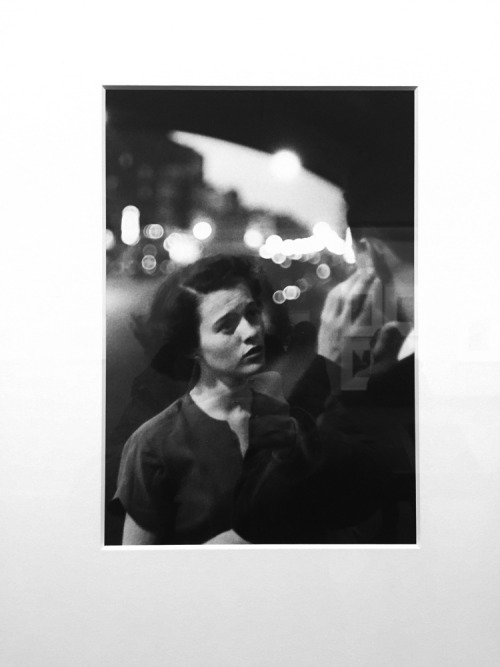 But this show concentrates on a single aspect of Faurer’s work: street photography and his love affair with the city, particularly Times Square, from the 1930s to the 1960s. 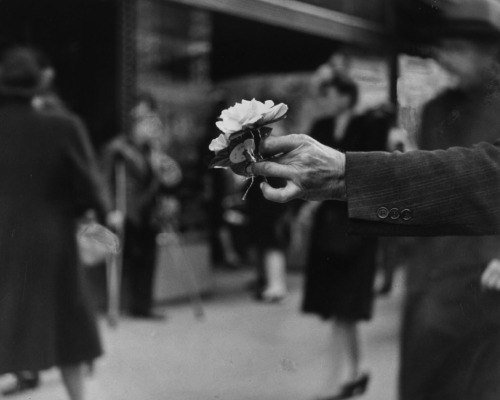 He began taking pictures on Philadelphia’s Market Street, details drawn out of the crowd – a hand holding a flower, or a beggar’s collection box – often refracted through the glass of shop windows, or silhouetted against theatre hoardings. Faurer left Philadelphia for New York in 1947. There he met Walker Evans, who introduced him to Alexander Liberman at Vogue, and Lilian Bassman, photographer and Art Director for Junior Bazaar, who hired him to shoot fashion. He was commissioned by Life, but quit, complaining that the work meant too much travel. Faurer was not particularly enamoured of commercial work, and many of the negatives and prints from his fashion shoots have vanished. Instead, his passion was for capturing poignant moments in street life, and for printing. Faurer experimented with camera and developing techniques, including blurring images and double exposures, slow film speeds and strong cropping. He had a reputation for being touchy and difficult – which did not help his commercial career – but this made him a relentless perfectionist in the darkroom. Faurer was recognised with a National Endowment for the Arts Photographer’s Fellowship Grant and a Guggenheim Memorial Foundation Fellowship Grant. Solo exhibitions followed (Steichen had already included him in shows at MOMA), and Faurer’s work began to be collected. His photography career came to an end following a traffic accident in 1984. Louis Faurer died in NY in 2001. His images are never sentimental, despite the fact that their subjects may be needy or sad. The girl looking anxiously at the man in Deaf Mute comes across not as someone the photographer wants us to feel sorry for, but as someone he wants (us) to understand. 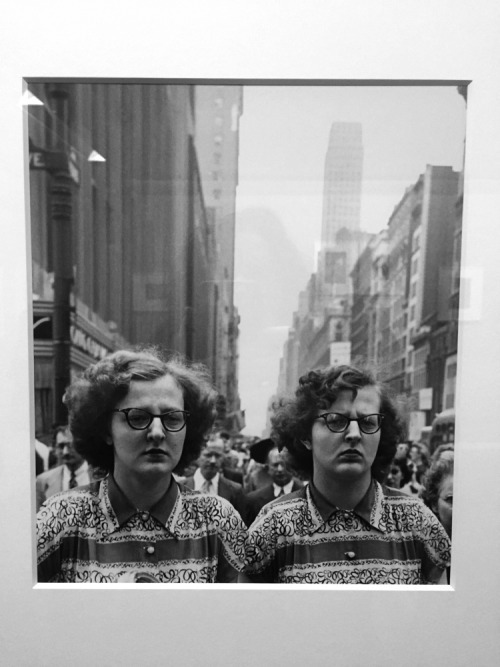 And subjects like the nerdy identical sisters in Twins are not isolated as oddities, the way Diane Arbus might have seen them: they’re just part of the crowd, who happen to have caught the photographer’s eye. Faurer’s great gift is for finding the lonely figure in any crowd, and gently making us see them too.